Adobe Systems will add a fourth tower across the street from its current three-tower headquarters in Downtown San Jose. The new building will allow Adobe to more than double its San Jose headcount and add another 3,000 employees. In a matter of a few months, Downtown has added multiple gourmet coffee shops including The Proper Cup at 1 S. Market, Chromatic at 17 N. Second, and Academic Coffee at 499 S. Street. Blue Bottle is also coming to 1 W. Santa Clara. This is in addition to Downtown's already stellar lineup of coffee shops: B2, Bel Bacio, Caffe Frascati, Devine Grind, Philz, Vero's, Voltair, Crema, Social Policy, and Ola's Exotic African Coffee and Tea. The MarketCenter has added two new stores, Blaze Pizza and a Wells Fargo Bank. Miami Beach Club at 417 S. First has opened a taco bar called Taco-a-go-go. JuiceAlize juice cart is now part San Pedro Square at 153 W. Santa Clara St. on weekdays from 8:30am-3:30pm. Erik's DeliCafe now has a second Downtown location in Riverpark Tower I at 333 W. San Carlos. 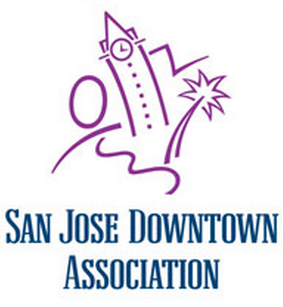 City Dance San Jose returns each Thursday from Aug 24-Oct 12, offering free dance lessons at Plaza de Cesar Chavez from 5:30pm-9pm. Silicon Valley Pride Festival will take place Aug. 26-27 at Plaza de Cesar Chavez and South First Street. Two Bay Area developers have teamed up to propose a 1 million SQFT office compace at 440 W. Julian (behind the San Jose MarketCenter and near SAP Center/Diridon Station).